RSVP on The Net Location site. See you there! Great networking event for young entrepreneurs! 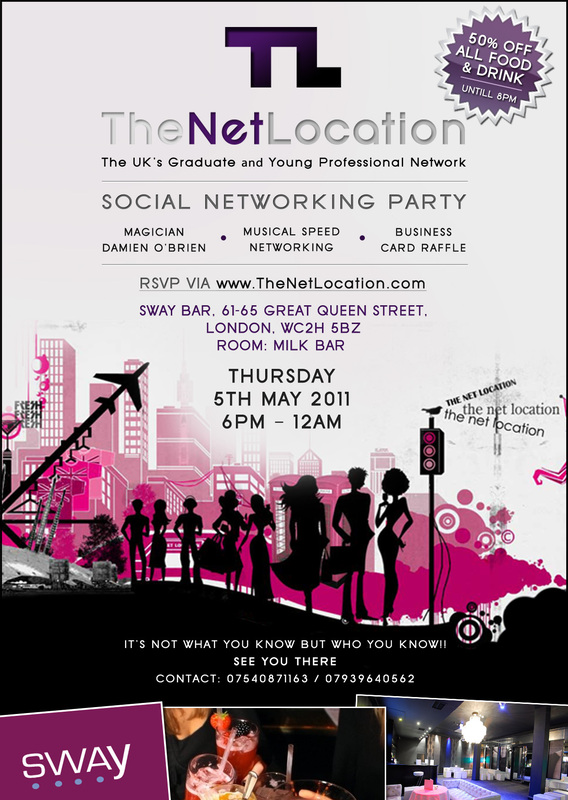 I am really looking forward to opportunity to network with like-minded graduates and entrepreneurs at The Net Location’s Social Networking Party this Wednesday 27th October 2010 at Graphic Bar, Golden Square, London. Finally someone has noticed the niche and taken the initiative to organise a networking event for young graduates, professionals and entrepreneurs in London. It’s been a long time coming! An intellectual crowd, adventurous cocktails, delicious food, good music, a professional photographer and a magician are all promised to make the networking night one to remember. Even better it is free to attend so for full details and to get on the guestlist go to www.TheNetLocation.com or send an email to rsvp@thenetlocation.com with your full name and occupation. The party kicks off at 7pm so I look forward to seeing you there! HOW GUTTED AM I THAT I MISSED THIS?! I want you ALL to head down to The Den tomorrow night (Wednesday 20th January) to help Haiti. Ctrl Alt Shift has partnered with Somenight and True Tiger to put on an unbelievable charitable music event to raise money for our Haitian family. Hundreds of thousands desperately need our help following last week’s catastrophic Earthquake and its aftermath. The line-up is any UK music lover’s DREAM; DJs, MCs, rappers, singers from many genres, signed and unsigned, uniting to do what they do best for Haiti. Wiley, Tinie Tempah, JME, Heartless Crew, Sway, MJ Cole, Shy FX, Mz Bratt, The Thirst and more are confirmed. All you need to do is go with as much money as you can afford to give and be musically blessed by UK’s finest! All proceeds will fund Ctrl.Alt.Shift’s response to the desperate humanitarian situation in Haiti. If you want to do more, you can ALSO donate directly to support Haiti here or here. If like me you can’t make it (ABSOLUTELY GUTTED), you can still help! Spread the word; share this link, e-mail everyone you know, use your free texts for a good cause, Tweet, Wastebook, phone calls, dare I say BBM?! We are one Human race. We are one family. Here in the UK we are so blessed, let’s show our love to our Haitian family in their time of need. Love and Healing to Haiti.